Australia is most famous for a wide range of deadly native creatures, but within the tank community, it is well known for its Cruiser tanks (AC I, II, III and IV Sentinel Cruiser Tanks). Whilst those Cruiser tanks were good designs in their own right, another vehicle, purporting to be a ‘Land Cruiser’, was not. Neither famous nor a sound design, the suggestion by Mr. S. Cossor of Albury, New South Wales, in March 1943 was very poorly considered. Just like so many other wheeled tank designs, Cossor went for the tricycle setup, with two large front wheels on a roughly triangular body and a third small trailing wheel at the back. Cossor sent in his idea in March 1943 for consideration and received a particularly quick and blunt appraisal rejecting the idea completely. A review of the specifications makes it very clear why. Cossor’s idea from January 1943 was essentially simple in desire and complex in delivery: “To provide a land offensive unit with more striking power than the largest tanks so far constructed, that could not be destroyed by ordinary mobile artillery, tanks, or landmines”. Further, perhaps understanding that the design was utterly unsuitable for use on roads, he envisioned that it would roll around without even needing roads, smashing through enemy fortifications and in doing so, roll flat a path for tanks and troops to follow. This is actually a common line of thought for these type of giant wheeled suggestions. In terms of bridges, Cossor, just like other similar inventors, assumed that the vehicle would simply be able, by virtue of its size, to cross even deep rivers. 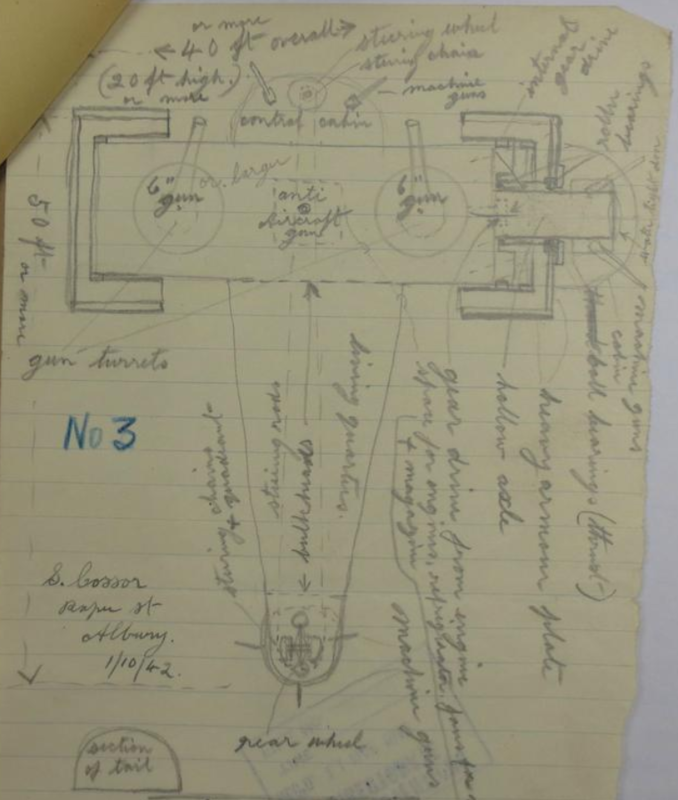 This outline sketched out in January was sent to the Army in March for consideration, although they were busy enough with conventional tank designs at the time. The Cossor Land Cruiser was huge, based around wheels about 16 1/2’ feet (5 meters) in diameter. The wheels, when viewed in cross-section, form a ‘C’ shape as they overlap the rolling pin shaped the main body with the axis of the pin forming the axles of the wheels. Although this was a rather neat method to increase the footprint of each wheel, it also served to raise the overall vehicle height to 20’ (6.1 meters). The overall length of the vehicle was at least 50’ (15.24 meters) ensuring that it was completely impractical to move around. The width of the vehicle was not much better, 40’ (12.2 meters) wide from wheel edge to wheel edge. A vehicle of such dimensions was near impossible to move by ship or road, as it was bigger than any bridges could accommodate and wider than a road. When the driving cabin ‘turret’ dome was added to the front, this projected past the front of the wheels and increased the length still further, and as if to make the impractical impossible, Cossor also added detachable sponsons to the wheels. These sponsons were large domes fitted to extensions of the axle pin for the wheels, so would simply hang and not rotate with the wheel. No easy access seems to have been provided from these sponsons to the main body, although the axle is supposed to be ‘hollow’. Likewise, no consideration seems to have been made of just how these huge and likely very heavy sponsons and driver’s stations were supposed to be fitted. On top of the ‘pin’ part of the body were two large turrets, and between them, a firing position for anti-aircraft guns. Down the trailing arm part of the body were meant to be ‘living quarters’, giving perhaps an indication of just how big this machine was and how many crew it would have to have. Right at the back was the wheel which controlled the steering that was directed by the driver located right at the front. An access corridor ran the full length of the design from the cabin to the compartment above the rear wheel. The entire body was to be clad in ‘heavy armor plate’ and the trailing arm was to be curved across the top, but other than that there is no indication as to exactly how much armor constitutes ‘heavy armor’, and an accurate weight for the vehicle cannot easily be estimated, although, from the size of it, the machine was to easily exceed 100 tons, if not more. Some of the design is hard to understand, as only 1 of at least 3 drawings provided by Cossor has survived to this day. The surviving image does, however, give an idea of the size and armament of the vehicle and why it was so quickly rejected. Cossor did not spare the selection of firepower for his Land Cruiser making it look more like a Land Battleship than anything else. In the front driver’s compartment, ‘control cabin’ were 2 machine-guns positioned to fire at an angle across the front of the machine. Two further machine-guns were located in each of the large domed sponsons angled forwards and back, and three more machine-guns were located in the tail section covering the rear. To this total of 7 machine-guns was added an anti-aircraft position on top. No weapon is specified for this position, but it is flanked by the two large circular turrets, each of which is supposed to be mounting a 6” (152.4mm) gun, presumably of naval origin. This enormous and adventurous design from Cossor received just a single page assessment. The weight, although not specified, “would be enormous and with only two main points of support the pressure per sq. in. would be very high, causing the wheels to sink into any ground at all soft – a common failing with these types of designs. This huge tank would also have required huge engines to power it, which were neither cheap nor readily available in wartime Australia, and the rest of the vehicle would also have been very expensive to produce. Too expensive to make it worthwhile. The design was also faulted for not being watertight as well as for being extremely vulnerable to enemy fire. It might have had thick armor after-all, but it was such a huge target that it would not have been able to hide and would easily have been targeted by enemy fire. The idea was duly rejected in total on 2nd April 1943 although perhaps the day before might have been more resonant. A left side profile and head on view on the Cossor land Cruiser with an average size man (1.7 meters/5 feet 9 inches) for scale. Both illustrations were modelled by Mr. C. Ryan, funded by our Patreon Campaign. A typical case of a little knowledge being absolutely dangerous! The trouble was that the general populace didn’t have the faintest idea of what was actually needed, nor what was practicable. lol it’s so WW1-ish. Looks like a beefed up or “improved” version of Tsar Tank.